If you have a business page on Facebook and you haven’t started using Facebook Insights, listen up. Running a solid business is always step one, but if you aren’t getting your message out to the right people in the right way, then your business will go down the tubes regardless of the value of your product/service. When is the best time for me to post? What topics resonate most with my audience? Who is my target market and where do they hang out? We can get answers to these questions with FB Insights, and finding these answers can be a total game-changer. Facebook Insights can show us which types of posts our readers want to read as well as when they want to read them. This “insight” is extremely valuable because it basically tells you exactly what to do to write a successful post that will increase engagement with your page. There’s a little bit of a learning curve with FB Insights, so for today let’s stick to the terminology. Impressions are the number of times your post is displayed. One person could view multiple impressions of the same post. For example, I may see a post come up in an update in my Newsfeed, and then see it again when one of my friend’s shares it. Reach is the number of people who received impressions of a post. Reach only counts each person once regardless of how many impressions they see. An engagement rate is the percentage of people that react to, share, clicke, or comment on a specific post. 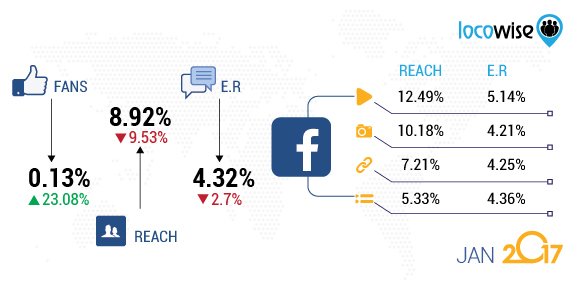 The average Facebook engagement rate in January 2017 was 4.32%. Video were by far the most engaging post format with an average engagement of 5.14%, while status updates, links, and images ranged between 4.2% and 4.4%. The lesson here is that videos, especially live videos, get more traction. Of course average engagement rate will vary by page size and business type. If you have a much larger audience or a business that focuses more on its online offerings, then you will likely get more engagement. Engagement rate can also be a little deceiving because it’s a percentage, so a page with millions of fans may have a lower engagement rate than a smaller fan page. The key to understanding your engagement rate is to pay close attention to it and watch how it changes and grows over time. You can also select similar pages to yours and add them to your insights. Facebook will help you view engagement on those pages’ posts so can track what’s working for similar businesses. Facebook Page owners will see a little button on each of their posts that says “Boost post”. (Note: this option is not available for personal page posts). Clicking this button will allow page owners to (for a fee) move their posts higher on the Newsfeed of their targeted audience (we’ll get to targeting later). I am NOT a fan of boosting. Boosting is Facebook’s way of helping you advertise without having to use the Facebook Ad Manager, which I’ll admit can get a little complicated. However, since boosting is meant to simplify things for you, there’s a lot you miss out on. Boosted posts tend to focus on engagement, which means if you’re looking for sales, conversions, or reach, you’re pretty much bleeding money. Facebook prompts you to promote your page by buying and creating ads that will pop up in the News Feed, on the right side of Facebook, and (if you want) on Instagram. Once you run a promotion, FB Insights allows you to track its performance. You can view the amount you spend throughout the promotion, the number of people that the promotion reaches, and the number of new page likes you get. Paying for reach or likes is definitely necessary for a Facebook Page, especially if you’re just starting out. However, the organic (natural) reach/likes are super important because this shows the true inbound marketing effect. Organic customers are finding you because your page naturally comes up in their searches, which means your stuff is a great match for what they want. At the end of the day, the more likes you get the more likes you get. But if you’re trying to understand what part of your content is actually generating likes, the whole process becomes a bit of a catch 22. Paying for likes is important because you have to have a least SOME likes if you want to show up in people’s search results, but once you start paying for ads it also becomes very difficult to understand what was actually working organically. I only spent $10 to promote this post, so the paid reach wasn’t very high. When you set up Facebook ads and promotions you can target a pretty specific market. Facebook gives you options for targeting location, age, gender, language, interests, behaviors, etc. Facebook has A TON OF DATA about its users, which is awesome for business owners because it allows them to really narrow down a niche market. Targeting is super important for a few reasons. First of all, obviously we want to send our posts and messages to where our target market will see them because those are the people we have in mind when we create products/services. What I find to be more valuable about targeting, though, it that it can show us where we get it wrong. For example, a Facebook business for high-end baby clothes might set up its target audience to be young, wealthy mothers, but maybe that results in very low engagement. The business can then alter the targeting settings to see if something else works better. Perhaps older women (50+) are a better target market for that business because the grandmothers and older generations in a family want to buy these clothes as gifts. Super random example, but hopefully you get the point. That’s it for now…If and when you’re getting into Facebook Insights, make sure you understand these terms! It can get fairly complicated otherwise. Does anyone else have a FB Business Page or want to make one in the future? Really insightful post, Katie! I don’t have a business page on Facebook, but I wanted to read the blog because my mom is a real estate agent and uses a business page to promote her business. It’s interesting to look through the different types of analytics performed on business pages – I’m curious to see if my mom uses them to see who is interested in her listings or the articles she posts. I sent this article to her to share some of your insight, especially since I know next to nothing about Facebook business pages. I’m curious to know how you use the analytics to alter your own business page, and if it’s made you change the way you do anything on your page. Very cool! Let me know what your mom thinks (or tell her to post a comment)! The analytics definitely change how I market my biz. For example, I get a TON of engagement on FB live videos, so I tend to post a lot of those. I also often get traction on posts and topics that I otherwise would’ve thought were pretty standard, so it’s always cool to see surprises like that and tailor my content. Thanks for reading! Awesome post! You really broke everything down into simple terms and examples, which made it extremely informative. I don’t have a facebook business page but I’ve found that these terms are thrown around in tons of different data & analytics articles/sites, so it was nice to have them defined. Have you ever looked at twitter analytics? I’ve been checking them on my personal account since I found out they were available simply because I think they’re cool/fun and the site aggregates them into easy to use charts/lists, but it seems like they use some pretty similar methods–I’d be curious to know what you thought about the depth/resourcefulness of Twitter analytics in comparison to Facebook analytics. I’d also love to hear more about your personal experience with Facebook analytics – how much do you rely on it for advertising/posting? Thanks for the comment Danni! So to answer your first question…I don’t really look at the analytics on Twitter (or Instagram) much for a few reasons. First, like you said, they aren’t very robust and don’t really tell me what I need to know about my audience. But more importantly, people that are buying my products are not coming from Twitter or Insta. Twitter is a great platform in terms of networking with my peers, but it’s not great for advertising. Instagram is a little better, but for the most part neither of those platforms direct much traffic to my website like Facebook does. Facebook has so many more options for posting and advertising. Plus, at the end of the day, it’s about finding where your target market hangs out, and mine happens to be Facebook. Depending on the business that will change. For example, my photographer friends get a lot of clients through Pinterest. Happy to continue this convo if you have more questions! Thoughtful and interesting post. This is tangentially related to me, as my wife works for a small business that could probably benefit from using Facebook more constructively. My question would be whether you use multiple platforms for promoting your business and if so, which not only offers the best tools but which has led to engagement that led to actual business? I think these types of advanced data analytics tools can be really useful, but is it easy to justify the expense/time over traditional marketing venues? Is it cheaper or more efficient to advertise on Facebook? Danny- great question. Check out my response to Danni’s questions in the previous comment because I think your questions are similar. I would just add that each platform serves a different purpose for me..Twitter is more networking with peers, Instagram/Pinterest help me grow my audience, and Facebook is my main POS and best way to communicate with my target market. At first the advertising can be a bit daunting, but I think it’s totally worth the investment. If your wife created a page and started to build followers (which takes some time), eventually she would be able to market directly to those people who already know/like/trust her and are much better leads than random people reading a flyer or billboard. The catch is that she has to be pretty active (post once a day or every other day) to start building those first few followers. After that though, like I said in my previous post, the more likes you get the more likes you get. Hope that was helpful! Great explanations! I run a couple “business” pages for clubs that I’m in, and I was always a little confused by the analytics. You laid it out really well. I think it’s cool how these features are available to any admin of a business page–from Google all the way down to my small club at BC. It’s interesting how you’re not a big fan of boosting posts. I’m curious how many businesses boost their posts just because it’s easy, while missing out on the deeper analytics. It’s kind of sad that the average engagement rate is only 4.3%. It is always disheartening to put so much effort into a post only to have a sad engagement rate. However, I think that opens up a whole new world of social media marketing–pushing engagement. I can easily see new research studies coming out about the formulas for optimal engagement—other than just videos. I actually intern at Jebbit, which is a digital media startup that focuses on interactive content to drive real engagement. We typically see engagement rates around 60%, which speaks to the viability of the engagement-focused business model. Really great post! I had to learn more about this over the summer for my job and having a guide like this would have been extremely helpful. Running a business page is definitely not easy and being able to understand these deeper analytics makes the job a little easier. Overcoming the challenge that exists when discerning what portion of engagement is organic reach versus paid reach after paying for ads sets the best ad managers a part from the rest. It gets even more complicated when considering how to generate viral reach since like an epidemic, the tipping point or “patient zero,” can be difficult to nail down. In effect, content marketers are not so unlike disease mitigators. This post effectively covered the bases in terms of relevance, organization, and thoughtfulness, so thanks for choosing to write on this topic! I’m curious what you would want to be different if you could change one thing about Facebook Insights. When we were looking to promote our summer programs for high school students I had a hard time finding anyone that knew much of anything about this, let alone was able to help me get things started. I think this topic should be used to create a hands-on course for the undergrad and grad programs because whatever business you are in, I don’t think you can survive without utilizing these tools. I also think there is a lot of career opportunity for folks entering the field with knowledge/experience in this area. Great post! Nice post! I think all the people who predict that snapchat will seriously threaten Facebook don’t understand the magnitude of the difference on the back end for advertisers.